Fiberglass reinforced panels, or FRP, are thin, flexible plastic panels made of strong polyester resin reinforced with fiberglass. They are used on walls and ceilings and can be installed directly over drywall, wood, concrete block, and many other solid surfaces. FRP systems include plastic trim molding to create a continuous durable, scratch-resistant surface that is easy to clean and mold- and stain-resistant. The panels can even be hosed down for cleaning. All of these qualities make FRP an excellent material for covering walls and ceilings in restaurant kitchens, public bathrooms, medical facilities, food processing areas, and many other environments requiring frequent deep-cleaning. FRP wall panels are ideal for kitchens, restrooms, dining rooms, offices, classrooms, hospital rooms, hallways, cooling towers, recreational areas, and other secondary spaces. One of the most important applications of FRP panels is that they can be installed over new and existing drywall or used to repair damaged surfaces. A: Fiber reinforced panels can be installed almost on any substrate, provided the surface is dry and stable. The panel system will not allow the surface to dry, so FRP should not be installed where moisture must escape from the original surface. Q: How do you install FRP over drywall? A: The standard method for installing FRP over bare drywall is to use a water-based mastic adhesive. If fasteners are desired, the panels can be secured with plastic pop rivets placed at the recommended intervals. The trim molding pieces between panels and at inside and outside corners typically are installed with metal staples. For maximum water-resistance, panels should be sealed at all trim joints with silicone caulk. 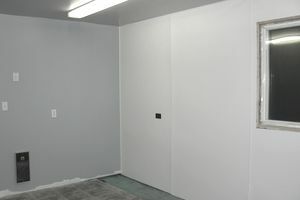 Q: How do you install FRP over non-drywall materials? A: FRP can be installed on most substrates using adhesive and/or rivets. Water-based mastic adhesive is suitable for some painted drywall or wood surfaces. For substrates that are glossy, rough, or not perfectly flat, such as concrete block or ceramic tile, an oil-based adhesive is recommended. Rivet fasteners require pilot holes drilled into the substrate. Fasteners typically are not necessary if the adhesive can bond properly. With hard substrates, such as tile or block, trim moldings can be glued to the substrate or installed with hardened steel nails. Q: What tools are required to install FRP? A: The best tool for cutting FRP is electric shears. FRP also can be cut with a jigsaw or circular saw, but saws create much more dust than shears. For easy installation, it helps to sand the edges of PRP panels that will go into previously installed trim molding. A quick pass with a hand-sanding block and coarse sandpaper bumps the edge enough to allow the panel to slip into the molding channel easily. Moldings can be cut with aviation snips or a miter saw. An electric stapler speeds the installation of molding on drywall. A drill and hammer are required for installing rivets. Panel adhesive can be applied with a notched trowel (included with some adhesives) or a homemade notched trowel cut from a scrap of FRP. Q: In what size is FRP manufactured? A: FRP comes in 4-foot-wide panels and in standard lengths of 8, 9, 10, and 12 feet. Trim moldings come in 9-, 10-, and 12-foot lengths. FRP panels are about 0.09 inch in thickness and weigh about 12 ounces per square foot. A skid of 100 4-by-8-foot panels weighs approximately 2,000 pounds.